If you are lucky enough to have your game published on Steam, this plugin will allow you to leverage some of the Steam features, namely achievements and game stats. Copy wme_steam.dll (the plugin itself) and steam_api.dll (Steamworks API library) to your WME installation directory. The Steam library needs to know the unique ID of your game (you will get the ID once your game is accepted to Steam). If the game is executed from the Steam client, it already knows the ID. However for testing purposes, you will need to create a text file in your WME installation directory, called steam_appid.txt. This file will contain the ID of your game. Define your game's achievements and stats using the Steam partner site (notice that each achievement and stat is identified by a unique string ID). To check whether the initialization was successful, check the SteamAvailable property. If the SteamAvailable property is false, something is wrong. The typical reasons are that either the Steam client is not running or you've provided an invalid game ID (see above). To unlock an achievement, call the SetAchievement method. It accepts a string ID of the achievement (the ID you assigned to your achievement when defining it) and it returns true/false, depending on the success. It is safe to call this method multiple times, if the achievement is already unlocked, subsequent unlock attempts will be ignored. Stats are some persistent values related to your game, stored by Steam across multiple gaming sessions. You can use them for tracking information such as the number of times the player started your game, the number of miles the player traveled in total etc. Steam can store either integer numbers or float (decimal) numbers. Just like with achievements, you define stats using the Steam partner site. To store a stat value, use the SetStat method. It accepts either integer or float numbers. If unsure about the value of your variable, convert it explicitly using the ToFloat() or ToInt() WME functions. To reload the stats/achievements states from the server, use the RequestStats. Normally you shouldn't need to call this method. The plugin will call it automatically upon initialization. To check whether the stat/achievement info is available, use the StatsAvailable property. Stat info is downloaded from Steam asynchronously, meaning that there may be a slight delay between plugin initialization and stats becoming available. Until this property is true, all other calls to methods dealing with stats and achievements are ignored. WME Lite / Any Linux developers out there? 1) Download the code in a compressed archive. Go to the downloads section, select the "tags" or "branches" tab and download the arcive of your choice. The "tip" tag represents the latest version of all files. 2) Clone the repository on your computer. You will need a mercurial client for this. If you prefer GUI tools, you'll probably want to use TortoiseHG. In TortoiseHG Workbench use the "Clone repository" command. The advantage is that you can later refresh your local repository by pulling new changes. 3) Create a fork of the repository on BitBucket. Use the fork link on BitBucket. Use this option if you want to work on the source code, separately from the main repo. You can then offer your changes by sending a pull request to the main repository. WME development is done in Visual Studio 2008. Therefore all the solution and project files, as well as precompiled dependencies are in Visual Studio 2008 format. It *should* be possible to compile in newer Visual Studio versions, but I haven't tried. Also, if you are using Visual Studio 2008 Express, you may need to install the Windows SDK and modify some of the sources (namely the .rc files, referencing the afxres.h file which is not included in VS Express). To be able to compile the engine and the tools, you will need to install DirectX SDK. WME comes in two flavors, DirectX8 and DirectX 9. For DirectX 9 it's been tested with the "DirectX SDK June 2007", which can be downloaded HERE. It may or may not work with newer SDKs, I haven't tried. The DirectX 8 version is more tricky. Since Microsoft doesn't support DX8 anymore, the neseccary header and lib files are no longer included in the SDK. To be able to compile the DirectX 8 version of WME you will need a fairly old version of SDK, which can be downloaded HERE (external site, MS doesn't provide the SDK anymore). 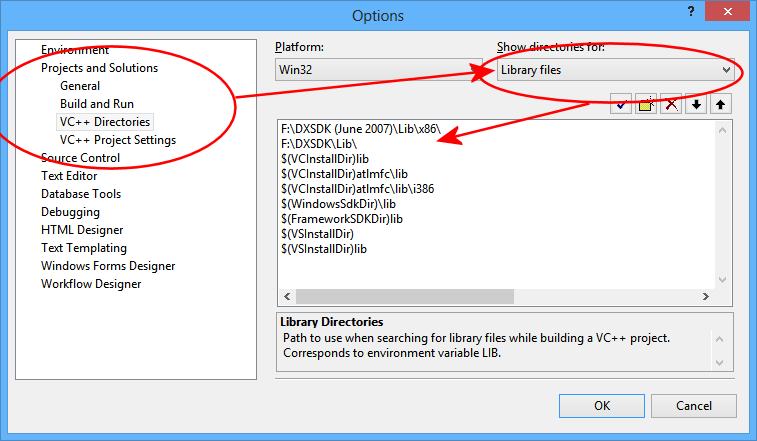 Next you will need to setup the directories in Visual Studio properly. Go to "Tools -> Options" and select "Project and Solutions" and then "VC++ Directories". Now setup your directories similarly to following pictures. The "F:\DXSDK\" path represents the location of the old DirectX SDK, and "F:\DXSDK (June 2007)" is the June 2007 DirectX SDK. Please note that the order of items DOES matter! 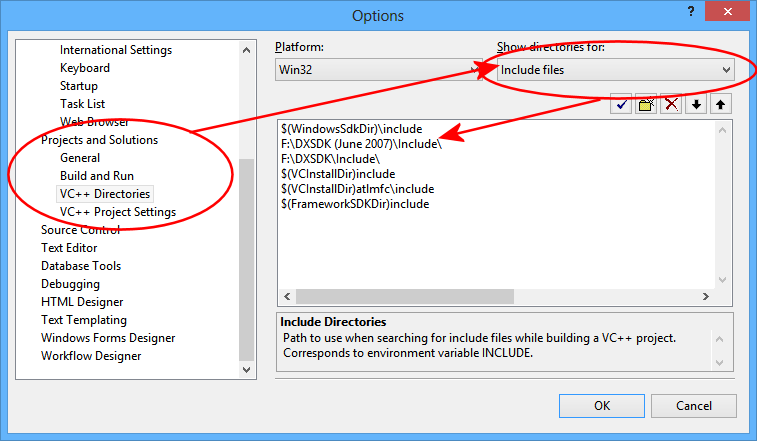 Note: In Visual Studio 2010 and later these directories are set on a per-project basis. Once you have obtained the source and setup your environment properly, you should be able to compile the engine and tools. There are many solutions included, representing various pieces of Wintermute Development Kit. What you'll be probably most interested in is the engine runtime itself. You'll find the solution file in "src\wme\wmeold.sln". By changing the build configuration you can choose between Debug, Release, Debug D3D9 and Release D3D9. The tools each live in their own directory, e.g. ProjectMan solution is in "src\ProjectMan\ProjectMan.sln" etc. There's a special solution for building everything needed for a complete Wintermute Development Kit. It's in "src\BuildAll\BuildAll.sln". However it probably won't wor for you unless you switch the build configuration to "Release" and unless you've build the individual projects before. But, must people won't need this solution anyway. The dependencies (3rd party libraries used by WME) can be found in the "src\external_lib" directories. They are precompiled for Visual Studio 2008, but if you are using a different VS version or if you want to get rid of the annoying "debugging information is missing" warning while compiling WME, you will need to recompile the dependencies. Each of the libraries comes with a .sln file which can be used for this. 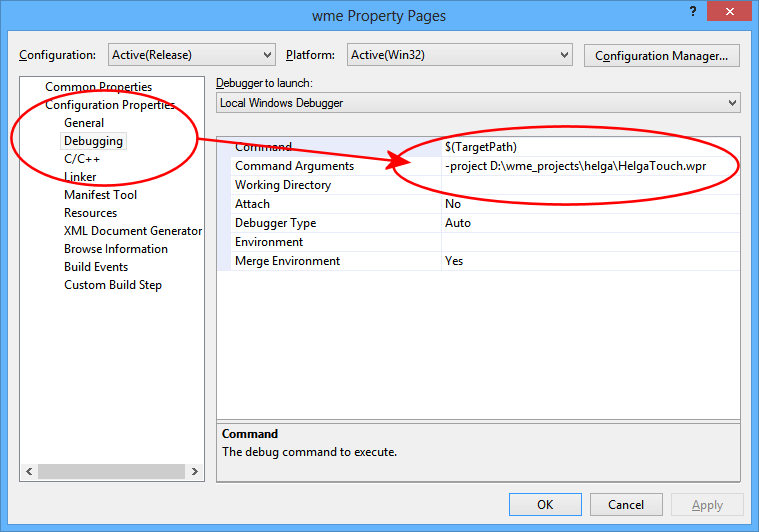 In the properties window choose "Configuration Properties -> Debug", and fill-in the "Command Arguments" field. Enter something like: -project "path_to_your_game\project.wpr" (remember to enclose the path in quotation marks if it contains spaces). Note that this option is build-configuration specific, i.e. different for Debug builds, Release builds etc. 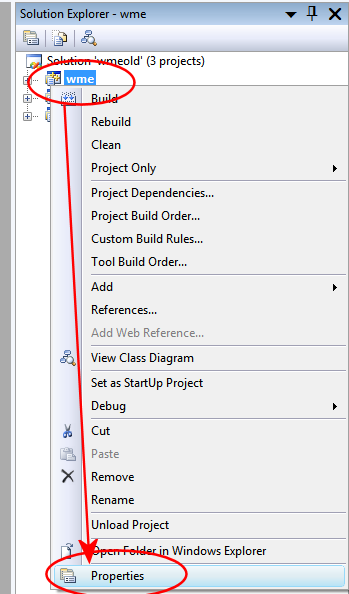 Next time you execute WME from Visual Studio, it should run the specified project. If you only see a black screen, it means WME cannot compile game scripts, because it can't locate the script compiler. The easiest way is to copy the "dcscomp.dll" file to the same directory where your freshly compiled wme.exe file is located (e.g. src\wme\Debug\wme.exe). The dcscomp.dll is the WME script compiler, and you will find it in your WME installation directory (or you can compile it yourself, the sources are included as well). From time to time someone attempts to port WME to other platforms. Before you attempt anything like that, please note that there already IS a portable fork of WME. It's called WME Lite and it has a dedicated forum section. The tools, I'm afraid, are totally non-portable. Also ScummVM does support WME games now. If you have any questions or suggestions related to WME source release, please start a new thread in this forum section. Community bulletin board / WME is 10 today! Wow, can you believe it? Today it's exactly 10 years since the very first public version of WME has been released! The world was different back then, both gaming and otherwise. Yet, somehow this little game engine survived and even 10 years later people are still using it to tell stories. And that was the point in the first place. For me, personally, WME has always been a huge learning experience and it helped me to find some very good friends. I don't think I could have asked for more. So... cheers, WME, for the next decade! Rock on! the company of our fellow developer metamorphium is finalizing their new puzzle game Vampires! and they are trying to get the game on Steam. Please support the game by voting for it on Greenlight (you need a Steam account). So far there are only minor changes compared to the Google Code repository, but I prepared a new set of iOS dependencies (see the Downloads tab) and updated the project settings. They will allow you to compile WME Lite supporting armv7 processors, which is now required. As you may know, WME Lite is using the SDL2 library for graphics. SDL2 is still under development and even the latest version does have some glitches, so I'm keeping the old hacked version for now. The good news is that once SDL2 is ready it will allow sprite mirroring and rotations to be re-enabled in WME Lite. The BitBucket repository is using Mercurial versioning system. I recommend using the following clients: tortoiseHG on Windows and SourceTree on Mac. Scripts, plugins, utilities, goodies / MOVED: How create perspective ? General Discussion / Merry Christmas and a happy new year! Hello everyone, I'd like to wish you all Merry Christmas (if you celebrate it) and all the best for the year 2012! Let's make it a very creative and fun year, okay? I finally upgraded the forum to the latest version. It took a lot of convincing, but things seem to be stable now. However, if you encounter any glitches, please post them in this thread. Thank you. This topic has been moved to Scripts, plugins, utilities, goodies. Page created in 0.904 seconds with 20 queries.